I made physics update and some graphical improvements, you can find link where links are, remember to set your wheel properly. There will be probably some changes later as I'm not quite happy how steering has quite little feel in it now, but rest is quite good, I think. 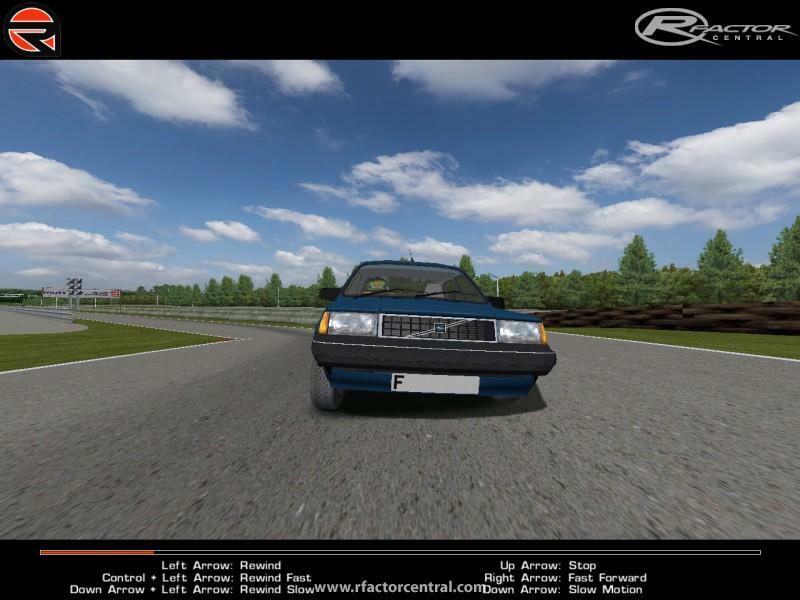 Update adds new Team Volvo cars cf, that car is now only one guaranteed to work, will do updates for rest later. It's 2011 already, puking currently what I have on HDD here, it is bit of a mess, has things that not work, has bugs and errors, but it's better than what has been here, work is slow, but progresses now and then. Read file inside the package before anything, also if using 900 degrees of steering, set steering to 29 degrees, I use brakes at 88% with G25, see what suits you. Proper way to fun is race suspension, ARB upg, LSD, semislicks, tuned T4 engine, too bad about brakes, but it has not vented discs at front and drums at rear, not up the task with such power, until I will make brake conversion upgrade available. If something does not work, it is broke, modder is not responsible it making something else broke, but may try to fix his mod, maybe even before rF2 comes out, who knows. Please can someone update the download links? Send me a message on here. Thank you from comments, there is however still lot to do until it can be as good as I wish. I did put up new version, it has lot of changes, what I did notice was that rear spring rate was wrong in latest physics2 update, it was about the double than what it should of been, there was also many other errors, because organizing the structure of mod and limiting options, much is now fixed but much is still left to do. I would love to have 3dr and 5dr versions too, but I have no enough time and my current skills are too low in 3d as well as graphical department that unless someone is willing to take that big task to make those models it would be well appreciated. I have V360Cup car actually made what comes to physics, but making paintwork is not my skills, there has been some who wanted to make paintwork for cupcars, but then they have gone silent and nothing has so far been emerged from efforts. What I would like to have is V360Cup racers, standard cars and car enthusiast modified versions, also RHD and LHD cars, but it would require a lot of work for some who is reliable and knows how to do those things. Often I'm asked from template, but sad thing is I have no idea how to make one and until what lies underneath is finished I doubt I have time to work on that aspect, anyone who knows how to make template is free to do so. New version has some engines and some graphical improvements as well, can't make half decent screenshot but there is some pixels in more or less random order below. hi guys, i love ur work. and i think i little bit. and i wanna try to make a Turbo engine to this car, like a little rally turbo engine with some hp and nm so u can make this car sideways, maybe like 200-250 horsepower. cause i have a engine i already done. so i just ask for permisson to make a turbo / rally engine to this car. cause this car have a so GREAT fealing when its sideways with some touqe! i think this car is one of the best when its sideways! but if i can, i have 1 question.. witch engine shal i use? i thinking about the B19ET or the penta or maybe 200K the B19 is really cool engine cause it have that nice sound in it.! btw this mod rock i almost only use this thing cause maybe it is slow but when u have a slow car without a diff and drive around a corner and give it and the tyre beginn to spinn i love that!! Make sure car detail level is set to MAX, other detail levels are not made to work yet, hopefully I can make those fixes soon, however all detail levels will be probably the same as I have no time or possibility to make lower detail models etc. I try to limit viewing ranges and amount of visible parts for lower detail levels so that should help a bit, but I guess almost everyone has now enough powerful computer to run these as full setting. Detail setting should not affect to spinner though, there must be then some error, but soon I can put new version up, which should fix some of the problems. Firstly, Great mod! The damage is amazing and even though they are a little slow they do become great fun racing in big packs. Now I only have one problem with the mod and it goes like this. Every car is missing the bonnet and one front wing on the spinner. When the cars are on track they all have a black base with stripes going accros the car. Now I don't know what the problem is, but I have tried changing to Direct X 9 and 8 but that didn't work. Hope you can solve this for me! Thanks from finding password THEDUMMY, I had completely forgotten that there was a password and haven't got slightest idea about what that password could have been, silly me. I have had little time to work with mod here and there might be tiny update, mostly graphical fixes, however we have several blackout in a day now, so might be only later on this week that I can make it such that it can be posted. I try to include also other engine options and also bring back the cup car if there is any interest for such.